Jordan Wallace chats with people at the Dajae Coleman Achievement Award Ceremony on Sunday evening at Koi. Wallace and Aaron Smith each received the first annual award, which goes to two Evanston Township High School freshmen in memory of Dajae Coleman. The nonprofit inspired by slain 14-year-old Dajae Coleman awarded its first annual achievement scholarships Sunday to local students. 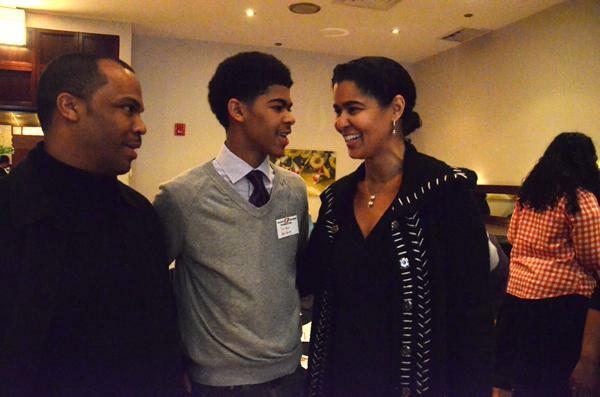 The Dajae Coleman Foundation, created after the Evanston teen’s shooting death, awarded the inaugural Dajae Coleman Achievement Award and accompanying $1,000 scholarship to students whose qualities and values mirrored those the teen exhibited. Board members raised money for the scholarships at the event at Koi Fine Asian Cuisine & Lounge, where Evanston Township High School students Jordan Wallace and Aaron Smith were presented with the award. The honor will be presented annually to two ETHS freshmen. The students will be able to use the scholarships once they graduate from high school, foundation board member Doria Johnson said. Candle lights illuminated a back room in the restaurant, 624 Davis St., where friends and family of Dajae chatted as a slideshow flashed images of basketball courts and of the ETHS freshman. Dajae’s mother, Tiffany Rice, said she hoped to spread the values of leadership, humility and academic achievement in her son, Dajae, who was fatally shot in fall 2012. “I knew that if those qualities were in him, I knew I could definitely find them in other students,” Rice said. To compete for the scholarships, ETHS students wrote essays related to Dajae’s “My Belief Statement” paper which he wrote for his Humanities class shortly before his death. ETHS humanities teachers recommended students for the scholarships, said Anita Thawani, an English teacher who nominated Smith. Dressed in a dark suit, Smith said he wants to use his scholarship money to enroll at Northwestern. Wallace said he could relate with the topics Coleman touched on in his letter. “I think the (event’s) purpose is to help young black men to become successful or through black men to help other black men be successful,” Wallace said. Funding for scholarship money comes from money from an ETHS fund, Rice said. The school created a memorial fund in September 2012 after Coleman’s death. The foundation has raised about $1,700 so far, which Rice said she hopes to designate as a repository for the organization. Excess funds from Sunday’s event will help reach its goal of raising $5,000, Rice said. As the foundation matures, it will organize more community events. In the spring of 2015, the organization will organize tours of historically black colleges such as Spelman College, Tuskegee University and Jackson State University, Johnson said. The foundation also plans to continue hosting book club meetings for youth in partnership with the Evanston Public Library. ETHS students on the organization’s youth advisory board also attended the event. Evanston Mayor Elizabeth Tisdahl attended the event and bought two Dajae Coleman Foundation T-shirts for her grandchildren. Created in 2013, the foundation has held events to commemorate Coleman’s life, including Dae Dae World Weekend in September 2013, where participants engaged in community activities. Part of the foundation’s vision is to make Evanston a “village” that stresses community-wide participation, Johnson said. Hundreds of kids attended an anniversary of Coleman’s birthday. ETHS sophomore Micquel Roseman, a former basketball teammate of Coleman’s, said his basketball teammates chanted Coleman’s name at a basketball game that fell around his birthday anniversary this year. “We’re going to play for Dajae … and we played really good that day too,” Roseman said.